Resident Evil: Code: Veronica is the fourth game in the Resident Evil series and is the unofficial sequel to Resident Evil 3: Nemesis. Developed by Capcom and Nex Entertainment (who did most of the developing under a contract deal; however, Capcom oversaw the game's overall progress) and released for the Sega Dreamcast in Japan on February 3, 2000, the game focuses on Claire Redfield and her story after the events of Resident Evil 2. 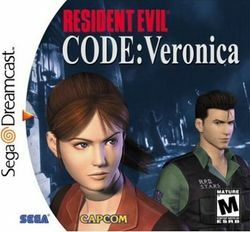 Code: Veronica is known for being a Resident Evil title originally released on a non-Sony platform (which the other three games were) and its highly-detailed three-dimensional graphics and backgrounds (a first in the Resident Evil series, as pre-rendered backgrounds were used in previous titles). The gameplay remained similar to Resident Evil 2, except for the inclusion of a quick-turn feature, dual-wieldable weapons, retries, and the ability to use a healing item when the player's inventory is full. Another version of the game, labeled Resident Evil: Code: Veronica X, was released for the PlayStation 2 on March 22, 2001 and the Xbox 360 and PlayStation 3 in 2011. It features longer cutscenes (and adds the ones that were excluded) and mild graphic changes. The Xbox 360 and PlayStation 3 versions featured enhanced graphics. This title depicts Claire Redfield and her capture after her failed attempt of infiltrating Umbrella's European headquarters. She is then transported to Rockfort Island, a prison owned and operated by Umbrella in the middle of the Atlantic. Shortly after, Claire wakes up in a prison cell, and at this point, the player assumes control of the character. This page was last edited on 27 November 2012, at 11:56. This page has been accessed 15,657 times.